Here is a miraculous poet made of music. She writes what the world needs to hear—what I needed to hear. She takes on our greatest mysteries and inheritances: love, desire, loss, family, activism, art, justice— and every poem changes the air we breathe. This debut reworks the mind as it breaks the heart with its beauty. To be fully alive, in the face of devastation, grief, and longing, a poet must make a song that could be eternal. Willa Carroll is fearless in the face of that challenge. Her music deserves to be sung everywhere—in the church of our earth, in the peace between lovers, in the halls of our learning, in the quiet places of illness and death and mourning. Hers is an art of perpetuity, and she is a genius whose words I hold my breath to hear more clearly. As we speak or sing, the tongue dances in a hot wet auditorium momentarily lit. Half public, half private, this book maps the body in lingual movements that accrete and erupt out of stasis, striking choral resonances, transmuting personal/local histories, straddling the elegant and the repugnant. Here is a force to be reckoned with, a memorable debut. 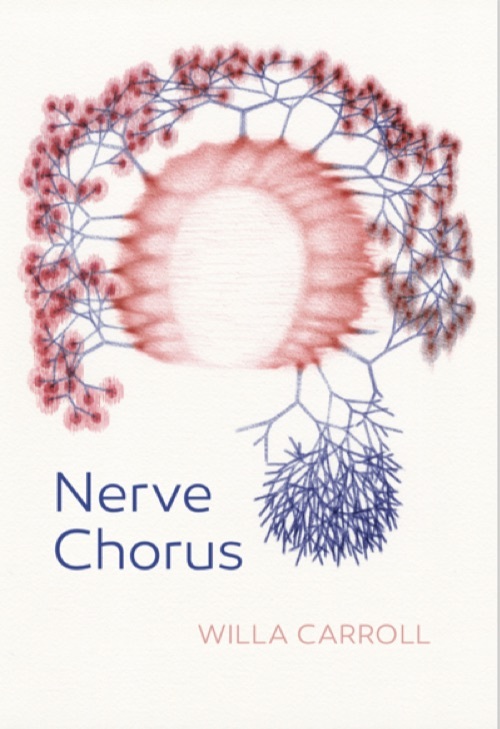 Nerve Chorus sings out of wreckage. The poems cast a spotlight on brutal inequalities, interrogating gender, class, race, violence, and capitalistic greed. From a young girl’s violation, to a father’s fatal asbestos exposure, the poems move with urgency and invention. A cast of artists and pop-culture heroes make unexpected cameos. Joining a chorus of voices, the visceral body and crackling mind move us from loss to resilience. Several times, breathtaking music and wordplay allow both poet and reader to enter additional narratives related to other layers of violence and power, such as our national Me, Too movement, or shootings that leave us grappling with the sudden disappearance of friends and acquaintances. . . . This is one of the bravest collections of poetry I’ve come across, and its themes connecting back to power and the body make it an important read for our time. It is a cleansing—a heartbreaking—exercise to try to unsee the seen and undo the done. In “Chorus of Excisions,” Carroll works with clean imperative strokes, revealing the outline of what is desired by paring away the great botch of our greedy endeavors. “Requiem for a Millennium,” meanwhile, conjures the movements of a Butoh dance, reading in them vivid associations of destruction and possible hopes of redemption.